The Rev. 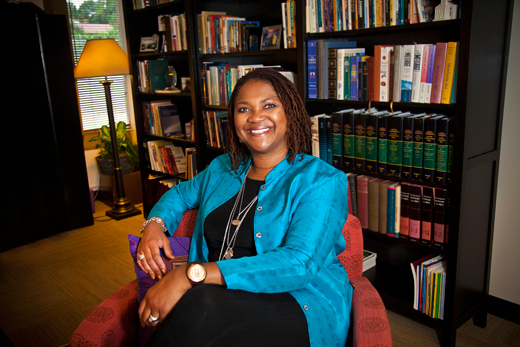 Bridgette Young Ross, who was drawn to ministry after a career in the corporate world, will be officially installed as dean in a Sept. 16 service at Cannon Chapel. Looking back at the path that has led to her new role as Emory's dean of the chapel and spiritual life, the Rev. Bridgette Young Ross identifies one constant that has continually shaped her life choices. She calls it "divine synchronicity." Only in that way does her journey make sense, this litany of diverse experiences — ranging from college studies in engineering and business to a career in the corporate world and a calling to the church — that would all become professional building blocks for her recent appointment. In her new role, Young Ross' charge includes strengthening Emory's vibrant interfaith dynamics; preaching and providing leadership on ethical issues; engaging students, faculty and staff in spiritual questions; and responding to issues of religion and the human spirit at a church-affiliated university steeped in a rich diversity of faiths. From 2000 to 2009, Young Ross served as Emory's associate dean of the chapel, working alongside and learning from former Dean of the Chapel and Spiritual Life the Rev. Susan Henry-Crowe, who left Emory in February to lead the United Methodist Church (UMC) General Board of Church and Society, in Washington, D.C.
"While it's challenging to follow someone who had been here for 22 years and was much beloved, I remind myself that I was also able to spend nine of those years working alongside her," explains Young Ross, who began her new role July 1 and is still settling into her office on the third floor of Cannon Chapel. "There will be ways that I do things differently, and for some, that may be a challenge," she says. "But it's also a wonderful opportunity to do something new." Young Ross describes the roots of her own faith as firmly ecumenical. Born in Chicago, she was raised in a Baptist family and attended Catholic schools before following a career within the UMC. "I like to say I'm bapti-catho-metho-costal," she laughs. "It's fair to say that I always had spiritual yearnings and felt drawn to God in some way." But high scores in math and science drew her to the Illinois Institute of Technology, where she considered a major in engineering. Her first physics class convinced her otherwise. With her academic aptitudes, an adviser suggested that Young Ross explore a degree in business, which led her to management information systems — essentially computer science. During a summer internship, Young Ross was introduced to marketing and liked what she saw. "After graduation, I pursued sales and marketing for three years, knowing I wanted to eventually go back for an MBA with a focus on human resources," she says. For years, Young Ross enjoyed handling human resources and employee relations for a major U.S. hospital supply corporation. But confronting a chronic illness forced her to "take stock of my life, look at what was most meaningful to me." By that time, Young Ross had become involved with Cascade United Methodist Church in southwest Atlanta. "The people there saw my calling before I did," she says. "They would ask, 'Are you sure you're not called to the ministry?' And I would say, emphatically, 'No, I am not.'" That answer changed abruptly one day during a phone call with a corporate head hunter. "He'd called with a job offer and I just blurted 'I can't take it, I'm going to seminary,'" she recalls. "I don't think I even knew it before that very moment." An ordained elder with standing in the North Georgia Conference of the UMC, Young Ross has served as associate pastor at two UMC churches — Cascade UMC and Mt. Bethel UMC — and as associate director of missions, ecumenical and ethnic ministries for the North Georgia Conference. But whatever the job, she was always drawn back to working with young adults and education. From 1998 to 2000, Young Ross was director of the Wesley Fellowship and United Methodist campus minister at the Georgia Institute of Technology. And for the past five years, she served as assistant general secretary of collegiate ministries for the UMC General Board of Higher Education and Ministry, in Nashville, Tennessee. Returning to Emory fills her with a sense of possibilities. "The work, the students, this community? I love it here," she says. "And I've always been impressed with Emory's ongoing sense of assessment — while we're doing so many great things, we acknowledge there is always more we can do to be greater." Originally posted August 20, 2014.